Defender Darren Jones says Newport County's players want caretaker manager Jimmy Dack to take the Exiles job full-time. 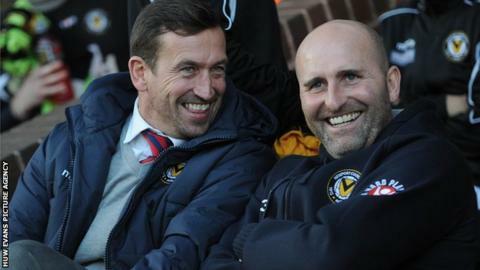 Dack was placed in caretaker charge after Justin Edinburgh left the League Two side to take over at Gillingham. Edinburgh's former assistant will again be at the helm for Newport's trip to Wycombe Wanderers on Saturday. "We all want Jimmy to take the job," Jones said. "We all like him but it's out of Jimmy's hands and out of our hands and it's down to the board. "Hopefully they pick the right person." Jones is likely to captain Newport at Wycombe in the absence of the injured Andy Sandell and he admits the players are still coming to terms with Edinburgh's departure. "We miss him, he was great and all the lads loved him," Jones added. "But that's football and you've just got to get on with it. "Jim's the same. The banter and everything is still here and the lads are still having a laugh." Former Newport County manager Dean Holdsworth has said he would welcome an approach from the club. Ex-Wimbledon striker Holdsworth, 46, spent three years at Newport leading them to the Conference before leaving for Aldershot in January 2011.